The results are definitely surprising to me considering the rising cost of wages in China. I think they are still dominating a major market share of T&A due to their resources, capabilities, and capacity. Although the wages are increasing there, China offers companies the ability to get things made in no time at all. For example, the article addressing why Iphones are made in China and will never be made in the U.S. notes of this. In China, most of the workers of some factories live nearby and can be called to work at anytime of the day. They can produce many things very quickly which other less-developed countries cannot compete with- and even the U.S. cannot compete with. People in the U.S. would never work more than their 8-hour shift and be on-call at all times. Workers in China invest their lives in their work, which in more developed countries, workers do not do. great points! I have to admit it remains a myth why “Made in China” is becoming even more price competitive despite the reported increasing wage level. in the 2018 USFIA benchmarking study, we asked companies the same question. According to respondents, the adoption of automation technology, improved supply chain efficiency, and currency factors could explain the demonstrated price competitiveness of Chinese apparel. Yes, the result are surprising to me because usually when the labor cost increased, the cost of product should also be increased. However, the statistic proved that it’s going against the norm. I think this trend happened because some sort of cost cut happened due to technology advancement, in which it made some process of production faster and cheaper. Machinery allows greater cost cut in various areas during the manufacturing stages. For instance, less workers employed, machinery reduces the amount of fabric waste during the cutting process and minimizes sewing errors, which ultimately lead to less loss and greater profit. Therefore, although the wages of labor increased, the overall price of “Made in China” goods still remained competitively priced in the U.S. market due to cost cut. I think China will remain as an important, competitive sourcing destination for U.S. fashion brands and retailers in the future because China is still considered as a developing country and there are lots of potentials that we still can’t predict yet. These results are very surprising to me. We all know that China produces and exports so many products but I think it is surprising to see how much more products they make compared to the other leading exports. This could be because of technological advancements in China that other exporting countries like Vietnam just do not have yet. When the trade deal between the U.S. and China was being discussed everyone was so nervous that it was going to be this huge change but in reality it didn’t change as drastically as people were saying it would. China is able to stay so price competitive because even though their wages are increasing workers are very skilled and can make more products in less time. I think China’s future looks very bright in terms of U.S. fashion retailers sourcing from them. I think China is always going to be a leading exporter in the textile and apparel industry because no other country can match the combination of technology and skilled workers that they have. I find these results to be very surprising especially with the raise in wage costs that China is implementing. But you cant take away Chinas work ethic. Although there was a raise in labor costs no one can beat their work ethic, the workers in China are extremely devoted to their work/jobs with very little complaints and you will not find many workers like that in America. Even the Tariff war seems to not be affecting China either so it doesn’t make sense for the raise in wage costs to be such a problem either. The US has relied heavily on imports from China and relied on their quick work ethic and getting inventory fast so I don’t see the US shying away from China anytime soon. The future of China as a sourcing destination I still believe looks very strong because what gets done in China doesn’t always get done inAmerica and American companies need someone to rely on and get then what they need in a fast and efficient manner and thats where China will never lose its touch on America. The result is really surprising to me, especially when I read about the ” U.S.-China tariff war” has no effects to China, who still continuously export textile and apparel to the United States. China still remains the world leading exporter position in today’s market even though the cheaper labor cost is no longer being the primary reason that many countries choose it. With rising labor cost, the mature machinery innovation replaces lots of manpower and improve productivity. Because the Chinese government is pushing its companies to automate, boost research budgets and maker more higher-value products, it helps China is no longer to rely on making apparel but also to produce textile. Technology innovation is necessary and important for boosting a country’s economy and making an innovation change for an industry. It benefits for China to keep its leading role in exporting textile and apparel. I completely agree with this. It is interesting to me that although countries like the United States are looking to find a “new China”, there has actually been an increase in Chinese trade. One would think that if other countries were being brought into the mix, and everyone was steering away from China due to the fact that their labor costs have risen, that their exports have decreased, but it has actually become the exact opposite. In addition it is important to note that as the world is progressing, technology is also advancing leading to the maturity and growth in Chinese production. This was very surprising to me because it seems like China is not being effected. They are so far advanced that even though the production of goods has mostly been moved to developing countries, they really have not suffered at all. China is so technologically advanced that they come up with ways to overcome their problems. With all of this going on and the growing global industry, the US and China still heavily rely on each other for business. I think there is a time lag for the effect of trade war to take place, Chinese Textile and Apparel export to US has experienced slower growth in recent year. There is no doubt that China will still be the top exporter to US, but if you look at the share of Chinese textile export in total textile export to US, China has been losing shares (from 41% in 2010 to 36% in 2018) to India, Bangladesh and mostly Vietnam. It is surprising to me that China can continue to offer the most competitive costs while their labor costs are increasing. However, it is not surprising that they continue to be the top supplier in the T&A industry to America in most categories. It is important to remember that cost is not the only factor that we must consider when sourcing- there are many others, like efficiency, lead time, product quality, and country strengths (like India in embroidery, etc). Although the tariffs will definitely continue to be a set back for trade between America and China, we can hope that it will not greatly affect the T&A industry as much as it has affected others. It is surprising that China has no near competitors in the United States import market. The rising wages in China are affecting the price of apparel being imported into the United States. China is very advanced in technology, making it appealing to US retailers. Their prices are also very competitive in the market. I think China will continue to be the number one supplier to the United States import market in the future. The tariffs have not affected trade significantly. The results are not to surprising to me. Even though China may have rising labor costs it has more output capacity and technology advancements that most other countries don’t, that in turn are helping keep costs down for US retailers. Since China has more output capacity, they can offer lower costs for high volumes of production, similar to what we discussed in Case Study 3 about creating more long term or higher volume relationships with suppliers. Additionally China is very advanced in technology, which will also help avoid high labor costs by employing fewer employees and have machine operated production. Since the trade war does not include clothing items, yet, it is also no surprise to me that tariffs have been affected significantly. I also think that China will remain one of the top suppliers for the US in the years to come. 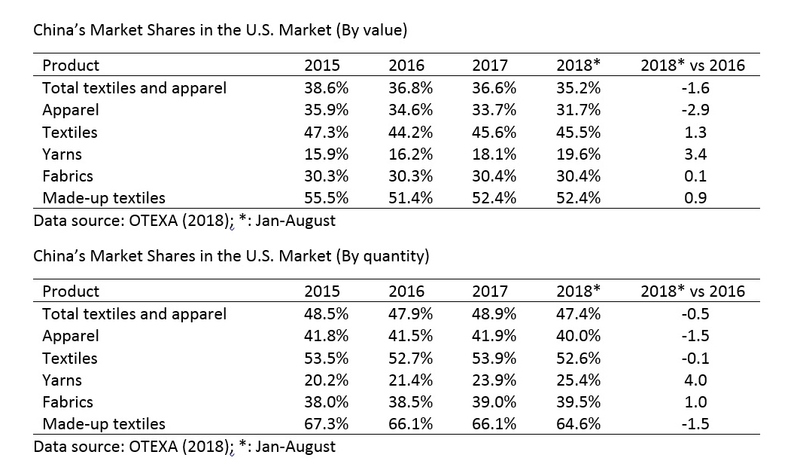 I think it is very interesting that the US China tariff war has not affected Chinas textile and apparel exports to the United States significantly. 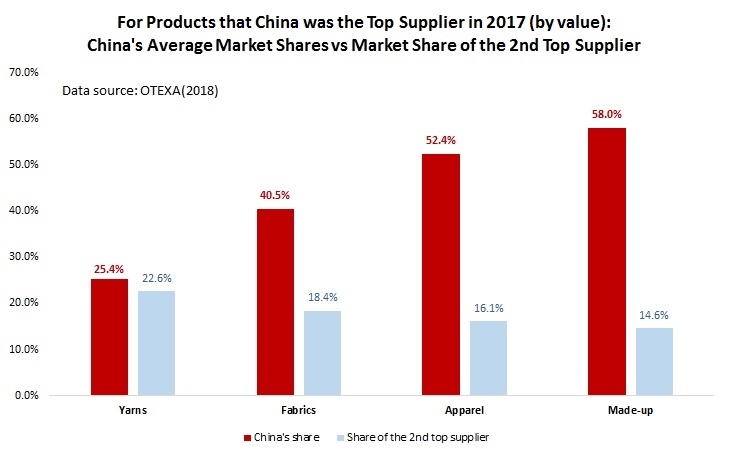 Its hard to believe that even though Chinas apparel exports to the US declined by 1% in value and o.3% in quantity from a year earlier, but their textile exports to the US increased by 12.3% in value and 7.2% in quantity. What could be driving these results? Are there lower tariffs on apparel than on textiles from China to the US? I am not surprised that China has no near competitors in the T&A market, the US has done so much fo their business there for so long and is just not looking elsewhere to produce for lower costs. I believe that future retail trends will eliminate the need for cheaper labor in other countries. one possibility is that more companies like VF will adopt the ‘third way strategy’ and stop searching for cheaper labor. 2) fast fashion will slow was consumers start seeing the value in better made products and want reduce the waste we produce. 3) AI and machine learning firms in china will draw back firms with their cheaper costs and faster lead times. It does not surprise me that China has no near competitors in the T&A sector considering their unbeatable productivity and work ethic. Even with rising labor costs, their fast turnaround rates and productivity in workers is what sets them apart from competitors and is one of the main reasons that the US has not turned to other countries for their sourcing of manufacturing apparel.